Much vs. Many: What’s the Difference? Home » Much vs. Many: What’s the Difference? Quantities and volumes can be confusing in English. Some nouns can be counted as individual items, while others cannot. There is a large amount of shade during the late evening, and there are several shades of orange and gold in the sky during these times. In this case, the same word is used for two different nouns. One of these nouns is countable, but the other is uncountable. You can count shades of the color red on a color chart. You could conceivably count shadows on the ground, but you cannot count the shade within those shadows. There are many of one, and there is much of the other. You can see why this confuses even experienced writers. 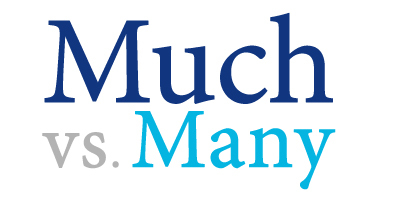 What is the Difference Between Much and Many? In this article, I will compare much vs. many. I will demonstrate the proper use of each word with example sentences and explanation. Plus, at the end, I will reveal a useful trick to help you decide whether to use much or many in your own writing. What does much mean? Much is also an adjective. It refers to a large amount of an uncountable noun. Examples of uncountable nouns (also called non-count nouns) include oxygen, sunlight, water, zoology, etc. The following sentences illustrate the proper use of the word much. I eat too much food, but don’t get enough exercise. There is too much wind to have a bonfire tonight. There was too much oxygen in the chamber, and the fire burned out of control. Some nouns can function as either a countable or mass noun, depending on context. Fish is a good example. See the following sentence. We caught too many fish today, and we cooked too much fish for four people. The first time it is used, fish refers to the number of animals successfully caught. The second time, however, it refers to the amount of a food substance that has been prepared. In your own writing, you should pay careful attention to context when choosing much or many, since some nouns can be quantifiable in some instances and unquantifiable in others. What does many mean? Many is an adjective. It refers to a large number of countable nouns. Nouns that are countable include airplanes, dimensions of reality, fastballs, princesses, victories, etc. You can see proper ways of using many in the sentences below. I eat snacks many times a day, but I never go to the gym. There were many King Louis’s, but only one Marie Antoinette. There are too many mosquitos to have a bonfire tonight. Here is a helpful tip to remember many vs. much in your writing. You can remember to use much with uncountable nouns since much contains a U, and the word unquantifiable starts with that letter. For nouns which you can describe using a specific number, choose many. Is it many or much? Many and much are adjectives that describe the amount of something. Many is used for quantifiable nouns, like suns. Much is used for unquantifiable nouns, like sunlight. Some nouns can be both countable and uncountable, depending on context. Be mindful of how you use these nouns in your writing, because whether you choose many or much depends on how you use the noun in question. If you can count a specific number of the noun, use many. If you can’t use a number to describe the noun, choose much instead. Since much and unquantifiable both contain the letter U, it’s easy to remember when to use much. 1 What is the Difference Between Much and Many? Lite vs. Light: What’s the Difference? Compare To or Compare With: What’s the Difference?